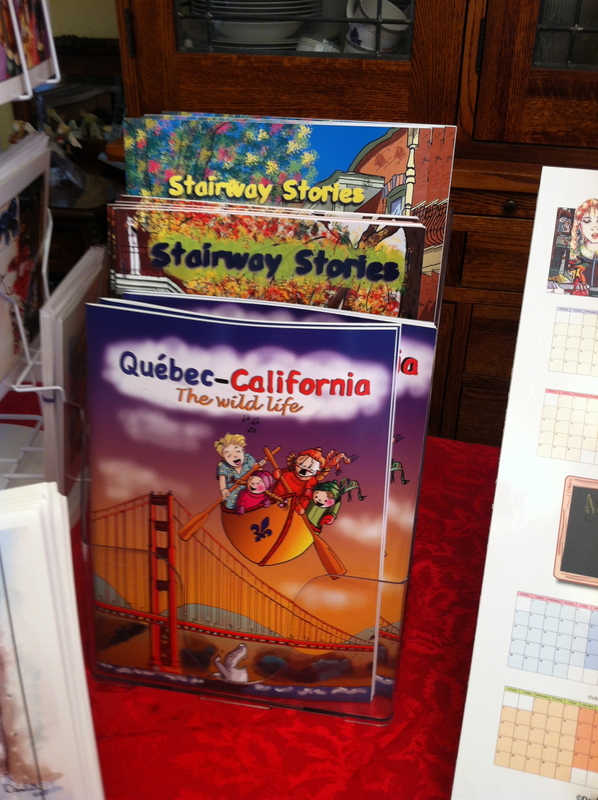 French Fair in Palo Alto. Comic Strip Workshops. March 21. 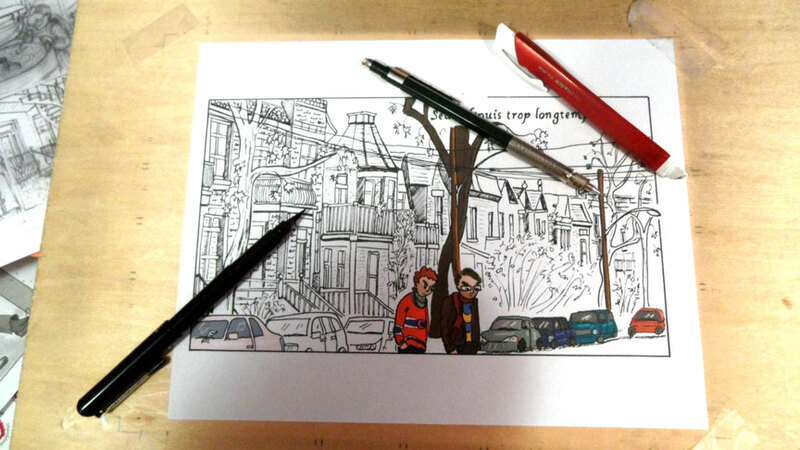 Ateliers de BD-Comic Strip Workshop. 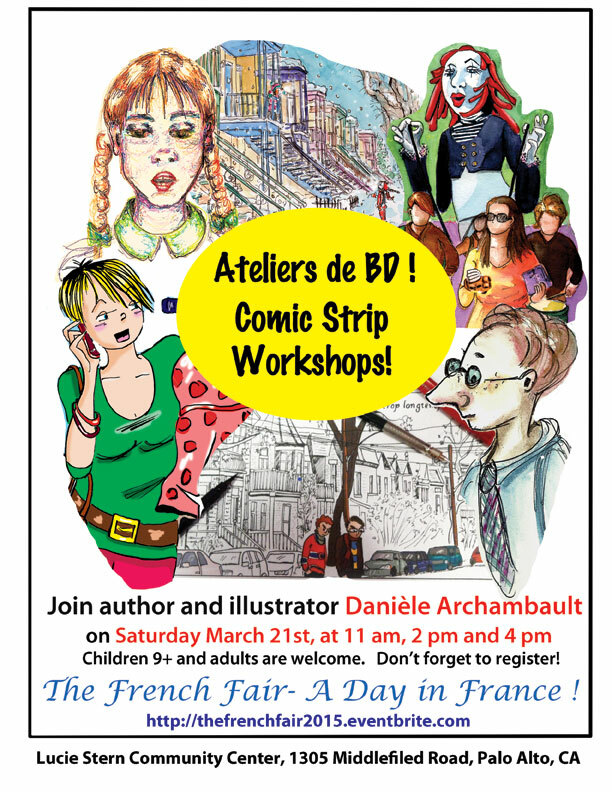 Comic Strip Workshop at the French Fair. Graphic Novel and Illustration Class! Graphic Novel and Illustration. Telling stories with images. My 10-week class for adults (16 years old and over) starts on January 7, 2014! Do you want to create images that tell a story? Do you have a story to tell, but want to add a visual element? Through ongoing exploration of various forms of sequential art (graphic novels, illustration, comics, travel diaries, etc. ), this class will be an opportunity for students to communicate thoughts, stories, and reflections on life through both words and pictures. 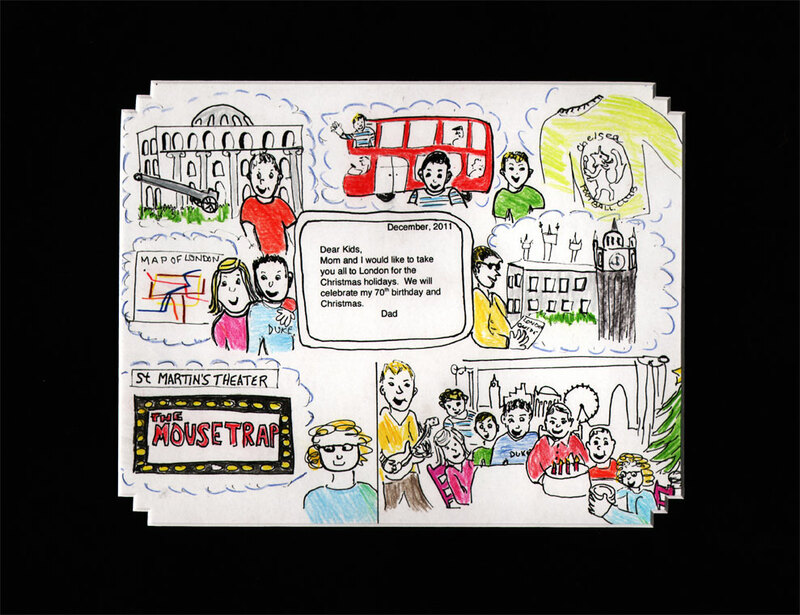 Warm-up drawing and writing exercises, step-by-step introduction to comic book art and experimentation with a variety of media will allow students to develop their own way of telling stories. Great class for sketchbook junkies, watercolorists, collage and book artists alike! Art beginners as well as experienced artists are welcome. Registration starts on August 30 for Palo Alto residents and on September 6 for non-residents. 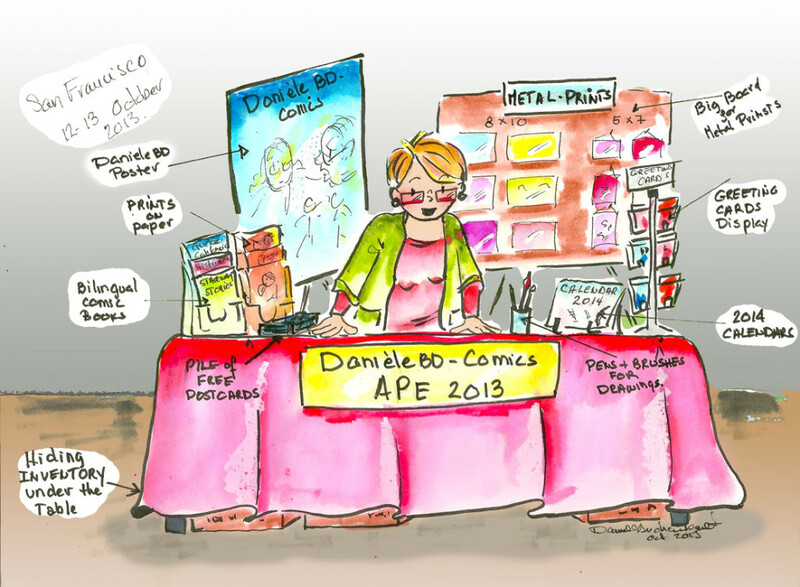 APE 2013 in San Francisco this week-end! I’m ready to go at Alternative Press Expo. I planned my table and took some pictures in my dining room. Come see me at Table # 606 and get a free postcard! Don’t miss my workshop! E-book Publishing 101. On Sunday, October 13, 12:30 pm to 1:30 pm, I’ll share my experience of self-publishing my first multitouch E-book. Get tips on conversion tools, file formatting, publishing options, pricing, and navigating the process without losing your mind or spending a lot of money. Greeting cards by Daniele Archambault. DanieleBD-Comics. Paper prints by Daniele Archambault. DanieleBD-Comics. Tabloid size. Comic Artist Badge for Cadette Girl Scouts. Comic Artist Badge workshop for Cadette Girl Scouts in Palo Alto. I recently led a workshop for a troop of Cadette Girl Scouts in Palo Alto, Ca. I have known the troop leader for a long time now and I knew working with her troop would be a pleasure. I met twice with the troop (a total of less than four hours) and we covered all the required steps to earn the Comic Book Artist badge. The girls chose the activities. Actually, they did more than was required, as often Girl Scouts do. The process included learning about the world of comics, choosing a story, writing a script, doing the thumbnails, penciling, inking and coloring (optional) their final panels on a good piece of drawing paper. At the end of the workshop, they had created a four-panel comic based on their individual story. I love working with Girl Scouts! P.S. I like working with Girl Scouts. As a child, I was a Girl Scout (Jeannette) in Montreal, Québec. 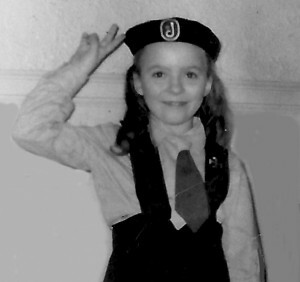 Here in Palo Alto, I led a Girl Scout troop for 12 years. I am now a facilitator, training Girl Scout leaders for Girl Scouts of Northern California. 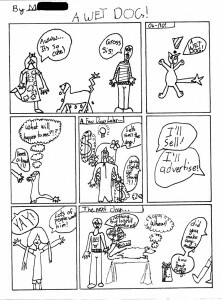 Some Girl Scouts did their comic page in black and white. Comic Book Artist Cadette Girl Scout badge. Workshop by Danièle Archambault. N.B. Because of Girl Scout safety rules, the girls’ name cannot appear on the website. 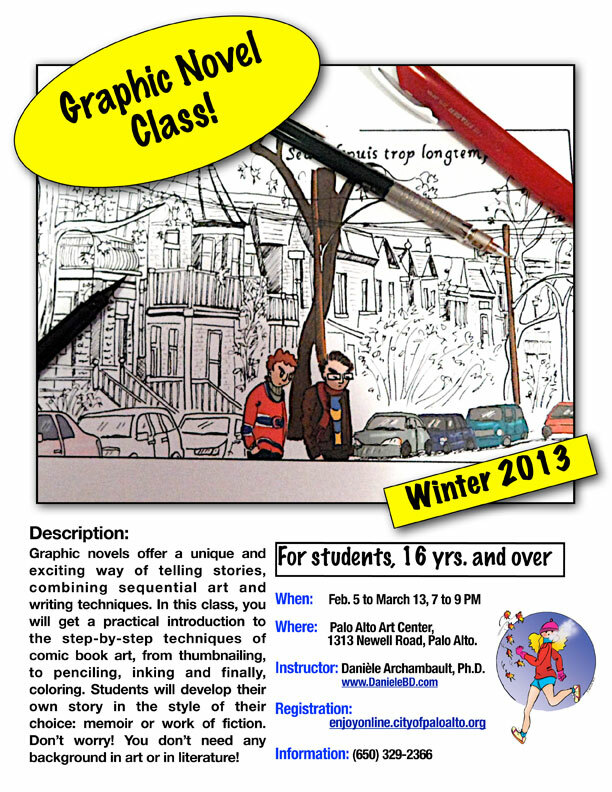 I’ll be teaching a weekly graphic novel class for adults at the Palo Alto Art Center, starting in February 2013. Students 16 years and older are welcomed. Develop your appreciation for the world of graphic novels. Graphic novels offer a unique and exciting way of telling stories, combining sequential art and writing techniques. In this class, we will explore the work of graphic memoir authors like Art Spiegelman (Pulitzer-prize winning Maus) and Marjane Satrapi (Persepolis). This will lead to a practical introduction to the step-by-step techniques of comic book art, from thumbnailing, to penciling, inking and finally, coloring. Students will start developing their own story in the style of their choice. Do you want to preserve the memory of the significant moments in your life, in a special and exciting new way? Start writing a graphic memoir. Or maybe you have a great idea for a work of fiction? Don’t worry! You don’t need any background in art or in literature! Just come with your stories (funny or sad), your special memories, or your personal reflections on life . 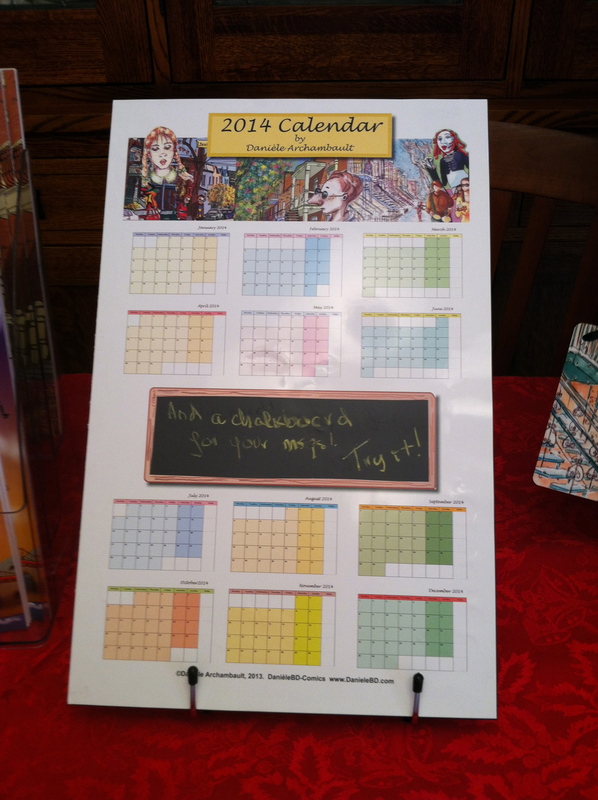 Start writing your own graphic novel in a fun and relaxed atmosphere. When? Tuesday nights, 7 to 9 PM. February 5 to March 13. Where? Palo Alto Art Center, 1313 Newell Road, Palo Alto. Registration? Register online or in person at the Palo Alto Art Center. Registration starts Nov. 30 for Palo Alto residents and Dec. 7 for non-residents. Graphic Memoir Workshop in San Francisco. Register now! 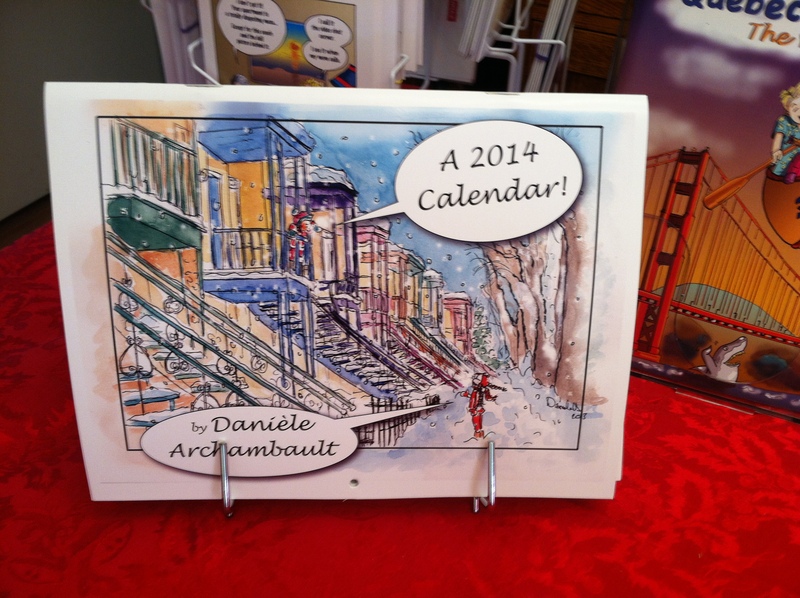 A Graphic memoir workshop with Danièle Archambault. Cartoon Art Museum in San Francisco. Everybody has a story to tell! Graphic Memoir workshop on October 21 and 28! Over the course of two afternoons, this graphic memoir workshop will introduce you to the art of preserving the significant moments in your life in a new and exciting way. First, we will explore the work of graphic memoir authors like Art Spiegelman (Pulitzer-prize winningMaus) and Marjane Satrapi (Persepolis). This will lead to a practical introduction to this rich form of storytelling, which combines visual and writing techniques. You will then start developing your own unique story in your own personal style. Don’t worry! You don’t need to have a background or special talent in art or in literature! Just come with your stories (funny or sad), your special memories, or your personal reflections on life. This workshop is for beginners to advanced students. Price: $50 general; $40 CAM members. 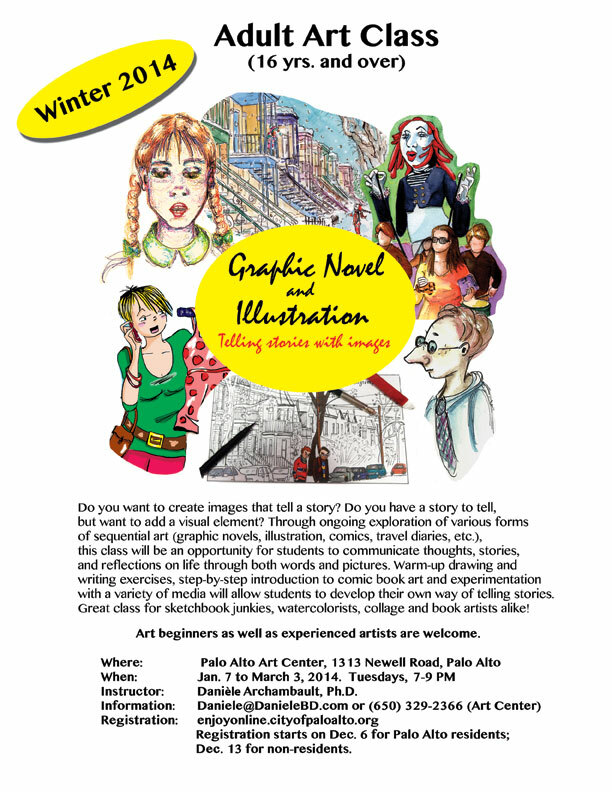 Another Graphic Memoir workshop will start tomorrow, January 24th. This time, it’s a series of six weeks. I’m looking forward to seeing what the students will produce this time. 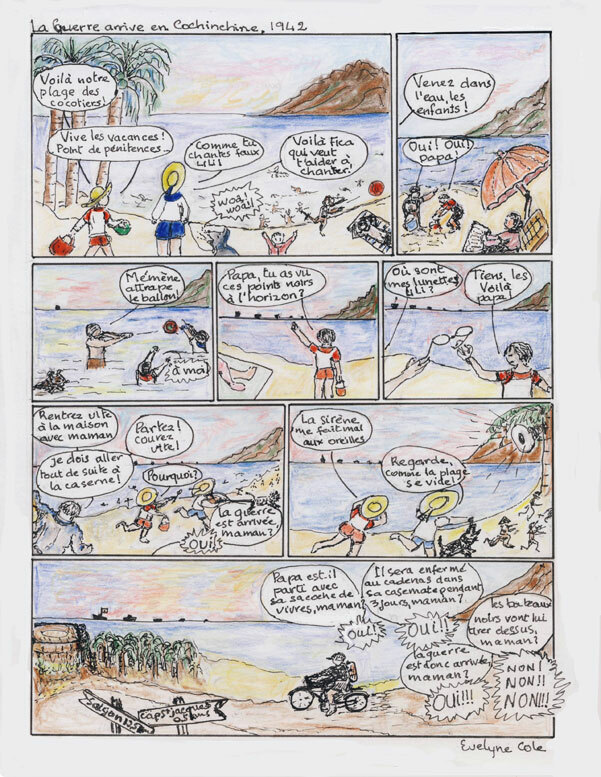 In a graphic memoir, an author narrates a period of her or his life, using sequential art to illustrate the story. In November, I held a workshop over the course of two afternoons during which students were introduced to this new and exciting way of preserving a significant moment of their life. Although the students did not have prior experience in that field or special background in art or literature, they produced beautiful and meaningful one-page stories. They developed their own particular story in their personal style. They chose different lay-outs to illustrate their unique stories. 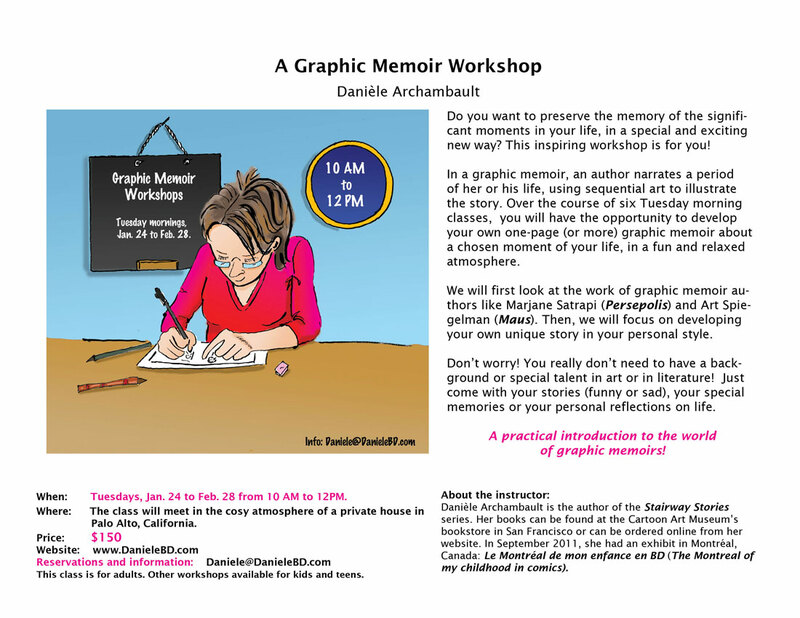 I’m starting another series of Graphic-Memoir workshops on January 24. Come and learn this new way of expressing yourself in a fun and relaxed atmosphere. 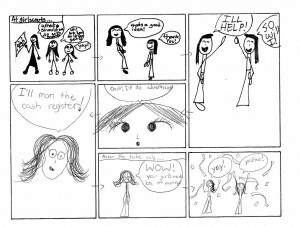 Here are pages from three of the students in the fall Graphic-Memoir workshop. For her project, Evelyne chose a special and dramatic memory from her childhood in Vietnam, at the time called “Cochinchine“. La guerre arrive en Cochinchine (1942) “The war arrives in Cochinchina” is in French, which is the language Evelyne studied in school in Vietnam, and in color pencils. In this story, she recalls the day Japanese destroyers arrived on the beach where she was playing with family and friends, marking the beginning of the Japanese occupation of Vietnam during WW II. Evelyne starts her story with a beautiful establishing scene, capturing the playful mood at the beach on a beautiful sunny day. Quickly, we see black menacing dots on the horizon and the joyful mood changes to an atmosphere of panic. The story ends with a wide panel capturing the chaos on the beach and the family’s anguish as they see their father, a family officer, pedaling towards the bunkers from which he will keep an eye on the Japanese invaders. A beautifully developed page, in terms of art and story. Evelyne had no prior experience in drawing. She is now planning to do more pages, keeping alive her family stories for the younger generations. In December, Leslie’s whole family was taking a special trip to London to celebrate her husband’s 70th birthday. Leslie decided that her page would commemorate this special event. This is a very interesting page layout that captures the spirit of the event. At the center, we can see the computer screen with a message from the dad announcing the trip to his children. Around that central image, different members of the family are shown already dreaming about what they will be doing in London. The last panel (bottom right) show the whole family celebrating the dad’s birthday. 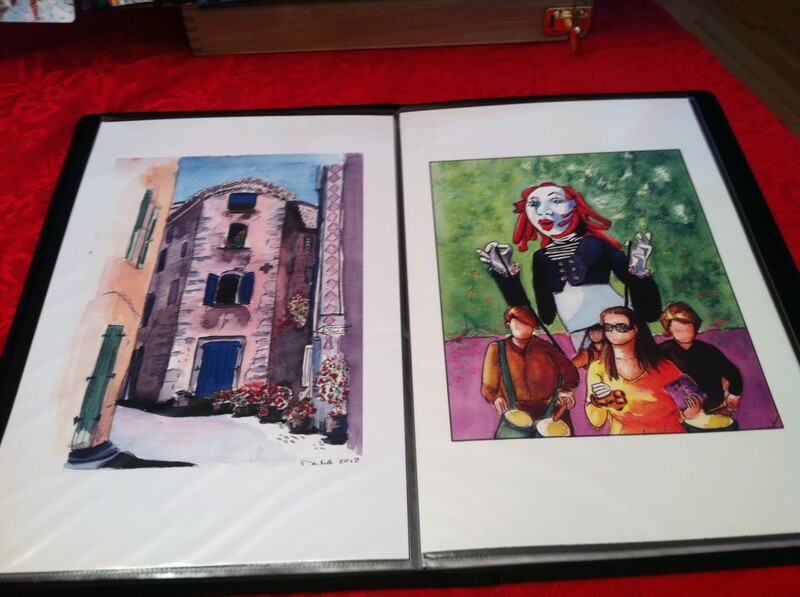 Leslie did the original art in black ink, scanned it and then printed multiple copies. She then colored each of the pages (color pencils). She surprised her husband with the first page on his birthday in London. The others will go to the children. A beautiful page with a clever layout capturing a special moment in a family’s life. Leslie was very hesitant and unsure of herself n the beginning. Her precious framed page will now hang in her living room. Leslie Burchyns’ page from the Graphic-Memoir Workshop. Pas loves scuba diving. During one of those trips, Pat and her husband Mike got to swim with humpback whales in a Tongan lagoon. They chose that remote South Seas spot to see the humpbacks in the lagoon where they come each year for their calving and mating. Pat wanted to preserve this amazing experience by telling the story in a humorous way: Both whales and humans are amazed at this first encounter. Pat chose to tell her story in black and white. The simple layout is very effective at capturing the grandiosity of the event. Pat started her page with an establishing scene panel, showcasing the enormous size of the humpback whales. 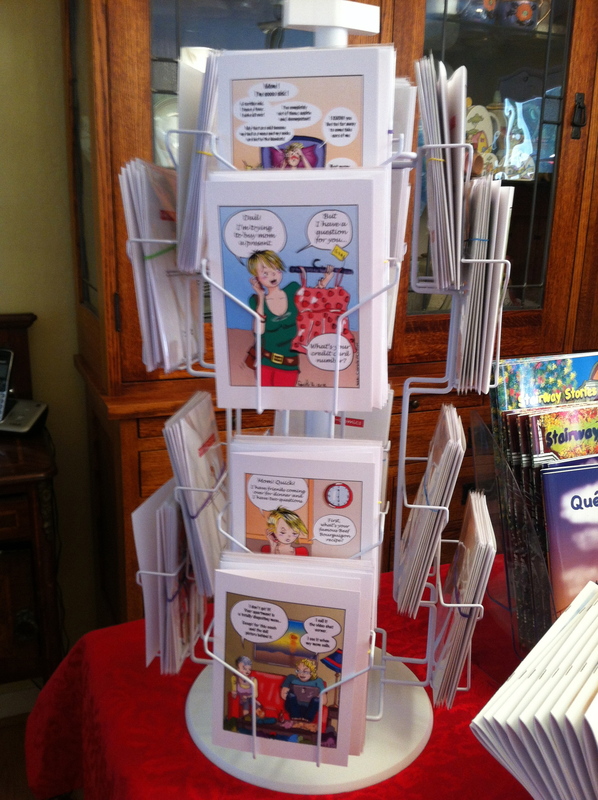 In the middle panels, Pat uses her own experience in scuba diving to illustrate how divers get into the water. 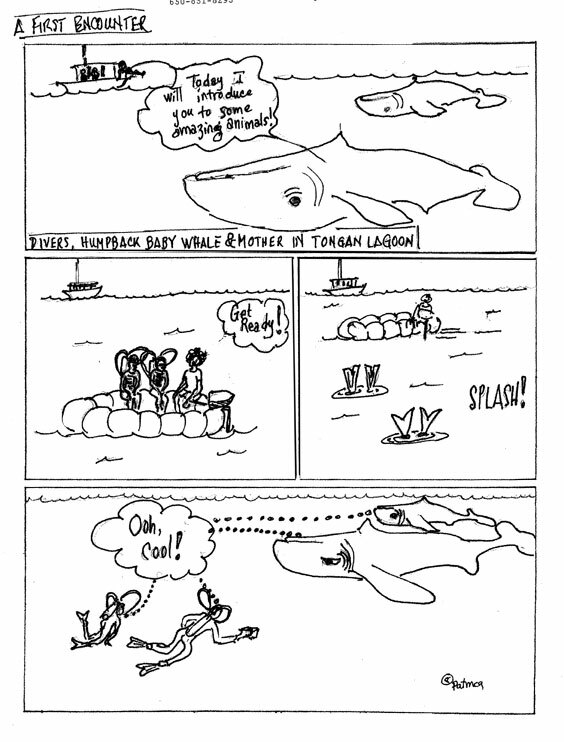 Finally, she ends her story with another wide and simple panel, emphasizing the parallelism between the experience of both humans and whales. A beautiful page, with a great lay-out, preserving, as Pat puts it “the encounter that was certainly the highlight of my diving years!” Pat is now working on the other stories she shared with us in the Graphic-Memoir workshop. Pat's page from the Graphic-Memoir Workshop. 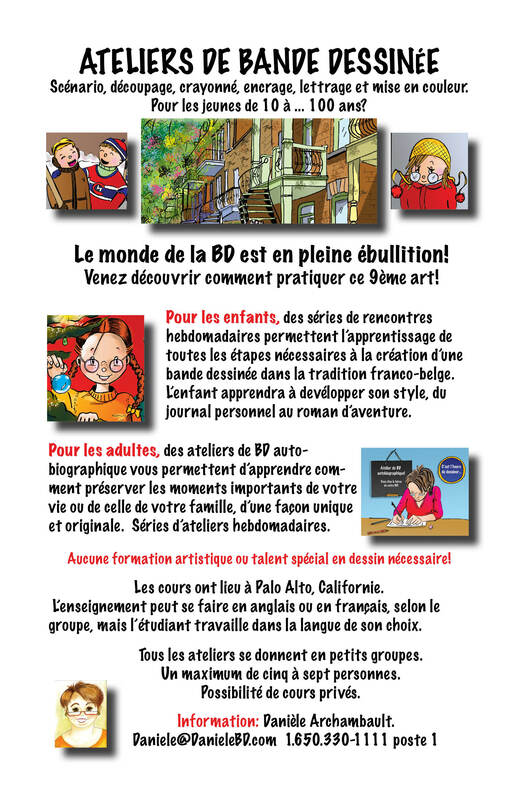 Ateliers de BD en janvier 2012. Je prépare des ateliers de BD pour janvier 2012. Je vais annoncer l’horaire bientôt. En attendant, si vous avez des questions ou des suggestions, n’hésitez-pas à me contacter. Voici l’annonce qui paraîtra à la mi-janvier dans l’annuaire de San Francisco Bay Accueil. Girl Scout Workshop. Some amazing pages! Atelier pour les guides. Des pages extraodinaires! A few weeks ago, I was invited to give a one-hour comic book workshop to a group of about 20 Junior Girl Scouts in Palo Alto. 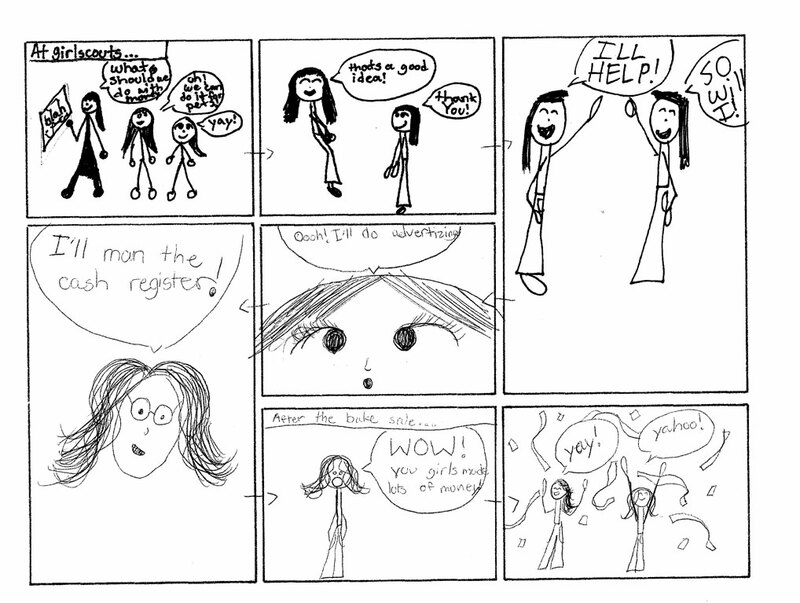 I helped the girls create a one-page comic book describing the service project they chose and the steps they needed to take to realize it. All about leadership and working as a group! You can click here to find out more about the workshop and to see some of the work in progress from the girls. Now, you get to see the final page of three of these Girl Scouts. Thank you to the leader who brought over their work. Congratulations to the girls for producing such amazing comic-pages! Il y a quelques semaines, j’étais invitée à donner un atelier d’une heure à un groupe d’une vingtaine de Guides (Girl Scouts aux USA), niveau Junior, à Palo Alto. J’ai aidé les jeunes à produire une page de BD décrivant leur projet de service communautaire et les étapes nécessaires à la réalisation de ce projet. Leadership et travail d’équipe! Vous pouvez cliquer ici pour en savoir plus sur l’atelier et pour avoir un aperçu des premières étapes de leur travail. Mais aujourd’hui, vous pouvez voir le travail final de trois de ces jeunes filles. Merci à leur cheftaine d’avoir apporté leurs dessins. Félicitations aux jeunes filles pour ces merveilleuses pages de BD! 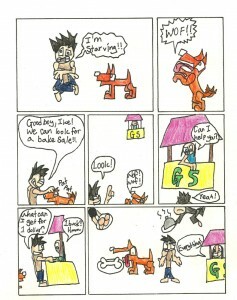 Comic-page by I...A Junior Girl Scout in Palo Alto. 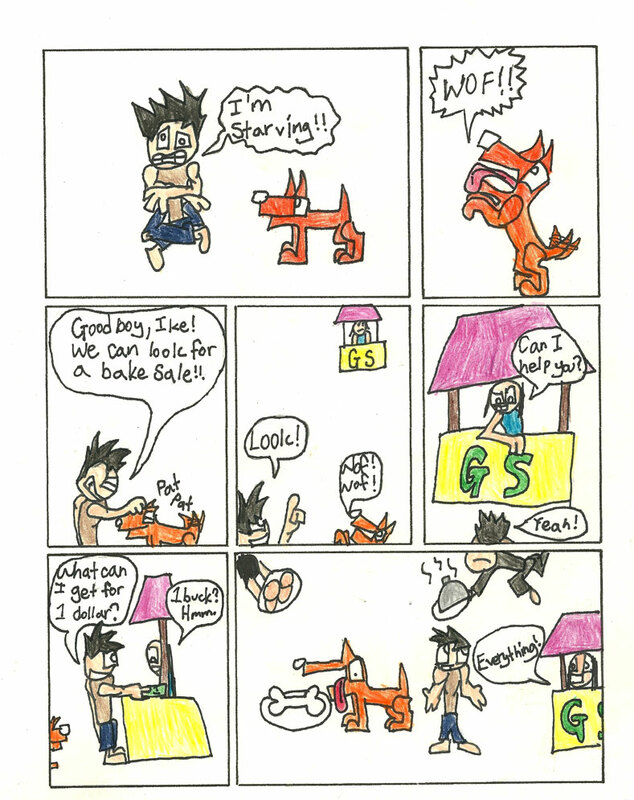 Comic-Page by M...A Junior Girl Scout in Palo Alto. 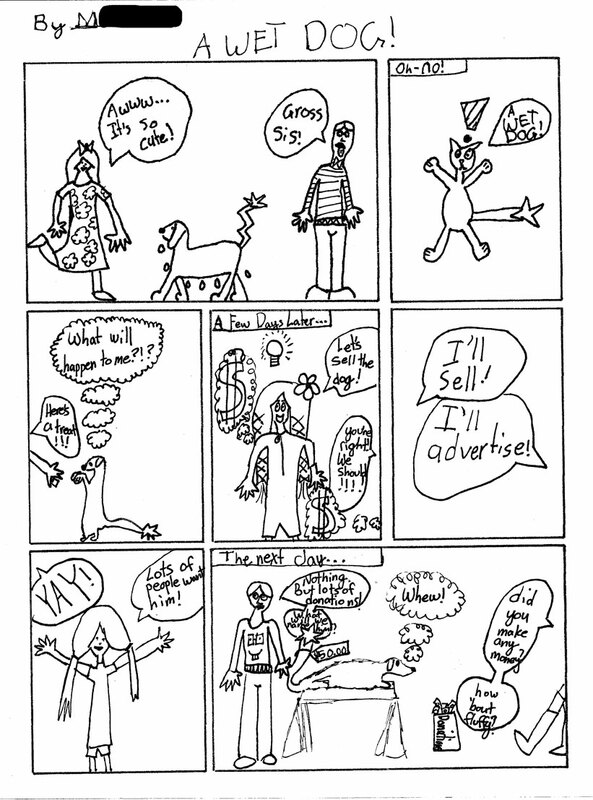 Comic-page by A...Junior Girl Scout in Palo Alto.